Few human resources issues are more frustrating than hiring an individual, only to discover a physical issue prevents them from performing the task for which they were hired. More employers today are investing in pre-employment testing to identify such avoidable issues. Pre-employment functional testing provides employers with a scientific method to ensure potential new hires can handle the physical requirements of the job while maintaining compliance with ADA guidelines. Musculoskeletal disorders are very common in the workplace, often requiring time away from work for employees and reduced productivity for the organization. Tests can include a range of evaluations from quick lift tests all the way through cardiovascular fitness and stress position tolerances. Standing or sitting for extended periods, and bending over to pick up an object are examples of stress position tolerances that can be evaluated. Studies show that costs associated with pre-employment functional testing produce substantial savings in terms of workers’ compensation costs for injury care. The most common savings come in the form of reducing the severity of injuries directly related to medical expenses and lost workdays. An employer is allowed to make a job offer conditional upon the person passing a pre-employment functional test. The employer has the legal right to rescind the offer if the prospective employee fails one or more parts of the test, assuming the test is directly related to the functional tasks of the job. It is important to administer the functional test to every person offered a job for that role. The ADA permits employers to ensure that a prospective hire does not pose a direct threat to the health or safety of others in the workplace. The EEOC expands that definition to include situations where there would be a significant risk to the individual worker as well. An assessment of the individual’s ability to safely perform the essential functions of the job must be based on a reasonable medical judgment that relies on the most current medical knowledge or best available objective evidence. The safest way to obtain such an assessment is by using an external vendor to determine the essential functions of a job. Isokinetic tests – The practitioner will test a person’s isokinetic strength using specialized equipment and compare it to a measured norm. Dynamic lift tests – Looks at the capability of certain muscle groups, usually involving actual equipment used on the job or a simulation using weights or lift boxes. The closer the test is to actual job requirements, the more defensible it is. 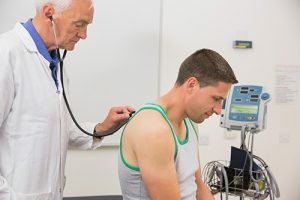 Aerobic tests – Measures a person’s oxygen consumption when performing aerobic physiologic work. The results are compared to the measured physiological requirements of the job to ensure the individual can meet the demands. For more information about pre-employment testing, please call Beth Keller, business liaison, at 573-331-3959.